I have been tutoring students in Mathematics since I was a college student. I love working one-on-one with students and help them truly understand complex mathematical concepts and problem solving strategies. I love to see the aha! moments in students when they finally understand math. And I love to help students apply the math theory they learn to solve problems in a variety of setting. I have a Doctorate degree in Mathematics, specifically, geometry and I would love tutoring students in subjects such as Calculus, Differential Equations, Linear Algebra, Algebra I, Algebra II, Geometry, or any kind of math that you need help with or are interested. I have taught and tutored Algebra over the past 9 years at many colleges and universities. I have tutored students one-on-one as well as teach many students in Algebra classes and I have been involved in selecting algebra textbooks and material. I love the subject and enjoy teaching it a lot. I have taught and tutored calculus at all levels (Single Variable Calculus and Multivariable Calculus) over the past 9 years at many colleges and universities. I have tutored students one-on-one, teach large lectures, small lectures, etc. in calculus and I have been involved in selecting calculus textbook and also writing a calculus book for business students. I love the subject and enjoy teaching it a lot. I have taught and tutored precalculus over the past 9 years at many colleges and universities. I have tutored students one-on-one, teach large lectures, small lectures, etc. in calculus and precalculus and I have been involved in selecting precalculus textbooks and material. I have a PhD degree in pure mathematics. I was a teaching assistant and tutor for Differential Equations for many years tutoring engineering students, math students and students taking Differential Equations. As a TA, I helped students one-on-one in the subject, teach recitation sessions, grade homework, quizzes and exams and answer all students' questions about the subject. I completed advanced coursework in Ordinary and Partial Differential Equation during my Doctoral study. I have tutored students one-on-one in Finite Math for 10+ years. I have also developed and taught courses in Finite Math at my current college. I have a PhD degree in mathematics with 10+ years of teaching experience at all levels of math including finite math. I have a PhD degree in pure mathematics. I was a teaching assistant and tutor for Linear Algebra for many years, tutoring engineering students, math and science students and students taking Linear Algebra. I have developed and taught Linear Algebra myself at my current college. As TA, I helped students one-on-one in the subject, teach recitation sessions, grade homework, quizzes and exams and answer all students' questions about the subject. As an instructor, I developed and taught the course. I also completed advanced coursework in Linear Algebra and Matrix Analysis during my Doctoral study. I have taught and tutored trigonometry over the past 9 years at many colleges and universities. I have tutored students one-on-one as well as teach many students in trigonometry classes and I have been involved in selecting trigonometry textbooks and material. I love the subject and enjoy teaching it a lot. Vinh is THE finest mathematician and tutor I have ever known. He has a rare combination of authentic expertise, which he shares in the finest collaborative approach. I have a degree in Molecular Biology and am wrapping up a second undergraduate degree in BioEthics with a minor in math. Vinh tutored me in college-level Math 306, Axiomatic Geometry. This class is an advanced course with heavy proof and logic requirements. Vinh has passion and is THE REAL DEAL – he takes JOY in solving math problems and in sharing his incredible math talent. 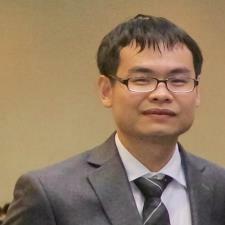 His enthusiasm made all the difference in earning an A. Vinh is patient, vigorous, and precise with his explanations. I felt like we were working “together” as a collaborative team – he was also very kind and accommodating when I struggled with a concept. I will remain in awe of Vinh’s mathematical ability and thankful to have had this time to work with him. I recommend him with the highest regard to all future math students of all abilities. Vinh D. helped me with understanding my linear algebra project and was encouraging and patient in helping me figure out what to do for each problem. He also sent me notes from the tutor session which were really helpful. My daughter just started her lessons with Mr. Vinh last week. He explains the concepts in Math well. That increases my daughter's confidence and her interest in Math. She plans to continue her lessons with Mr. Vinh regularly. My daughter need help with math and Prof. Vinh was able to explain everything in a way that made sense to her. Many thanks to him. I will definitely request his help again in the near future. Vinh is a very great explainer, even for complex, advanced math topics like Group Theory. Got a lot done in just a single session. Online approach worked just fine. Vinh is very knowledgeable and helpful! I have been working with Vinh for more than a month now and he has always been very helpful. His explanations are always clear and he is very knowledgeable in Geometry. Thanks, Vinh! This lesson was well laid out and effective for my son. They covered several concepts with which he was having difficulty. We will book again with V. I encourage you to do the same! Has very clear understanding of what he teaching and what you need to learn. Every question that I had for Vinh D, he was able to not only answer but show why it works! He is excellent as an educator and really seems to want you to learn and know what has taken the time to master. I would recommend Vinh to anyone trying to learn math!